I'm a little embarrassed to tell you this story. It reveals my lust for certain inanimate objects, namely pretty dishware. 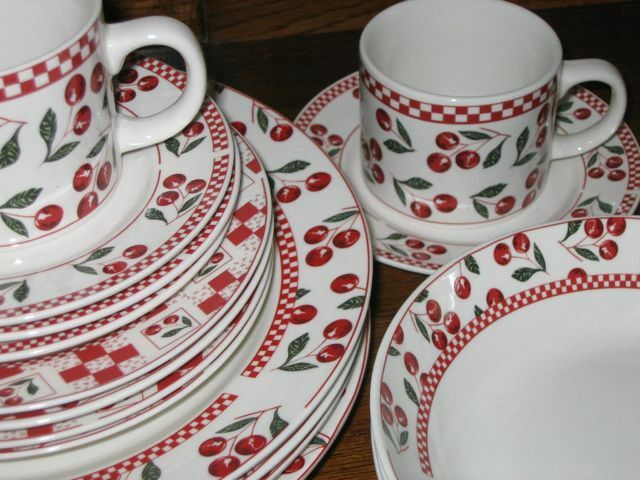 About six months ago I was prowling a thrift store and there they were: a stack of dishes that featured a frankly cheerful and unabashedly pretty cherry pattern. I was immediately smitten. I wanted them. I wanted them the way one wants a gorgeous but superficial cook book, only it takes up more space. I walked a few steps away. This was clearly a want, not a need. The price, while very good, betrayed the fact that these had not been on the shelf very long. I tried to talk myself out of it. Shouldn't I at least wait for a price reduction? But I knew these pretties wouldn't last long at any price. I showed the dishes to my husband, and he rolled his eyes. He did not see their charm at all. He raised several valid points about the impracticality of the purchase. I had to agree, at least in theory. Just then, watching from fifteen feet away, I saw another woman approach the dishes I coveted. My heart stopped. She inspected them carefully. "No!" my materialistic soul wailed silently. It was then that I realized just how much I wanted them. I held my breath; a few agonizing moments passed and the shopper decided against them and walked away. She had barely turned her back before I pounced on the prize and stacked the dishes into my cart. Score! I turned a deaf ear to my husband's protest. Besides, we are a family of four, and the set featured four dinner plates, four salad plates, four cups and saucers and four bowls! All for less than two bucks a piece! It was fate! And also, besides that, what could be more perfect upon which to serve a cherry claufuti? Surely you can see my impeccable logic. Ever since I heard about cherry claufuti, the traditional French dessert, I knew I had to make one. It featured several of my criteria for a perfect recipe: It was easy, and it was traditional and featured seasonal ingredients easily obtained. The recipe is essentially a pancake batter poured over fruit. 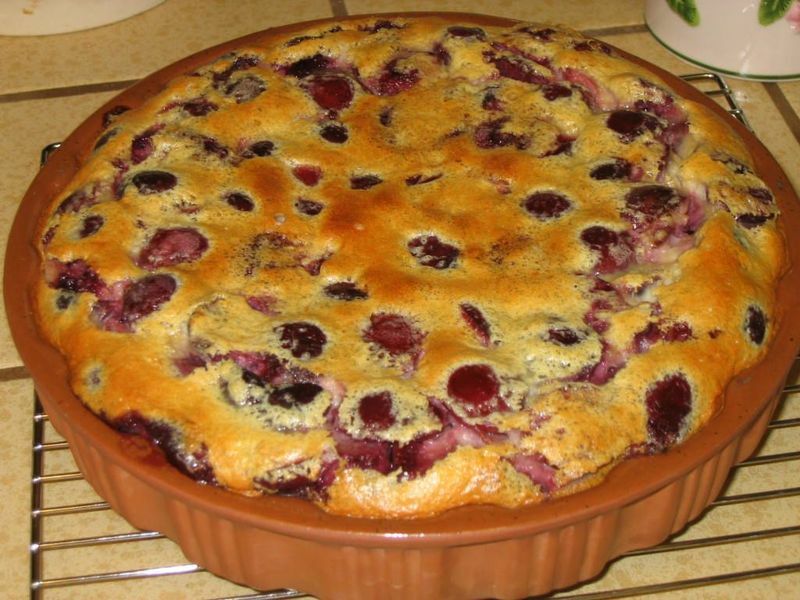 I could barely wait until cherry season to bake the dessert and use my plates. I used Julia Child's recipe in Mastering The Art of French Cooking. She has you mix it up in a blender, but you can also mix it by hand in a bowl. 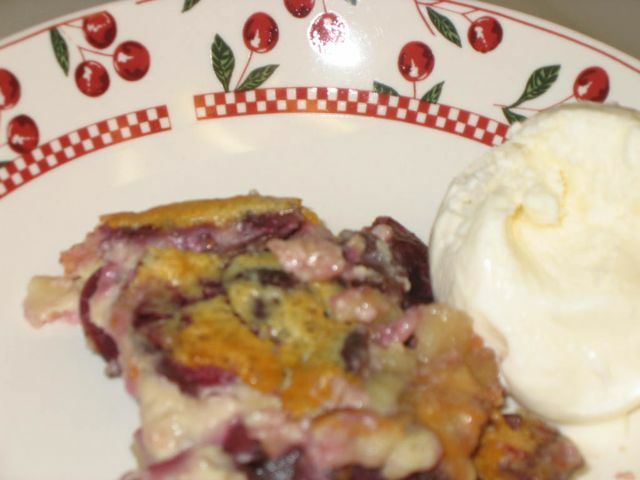 First, prepare a 7 to 8 cup, lightly buttered baking or pie dish and preheat your oven to 350 degrees F. Then pit the halve the cherries, and set them aside. Place all the ingredients except the cherries and sugar into a blender (or work bowl if hand mixing). Blend for one minute. Pour a scant 1/4 inch layer of batter into the baking dish. Set this over moderate heat for a minute or two until a film of batter has set in the bottom of the dish. Remove from heat. 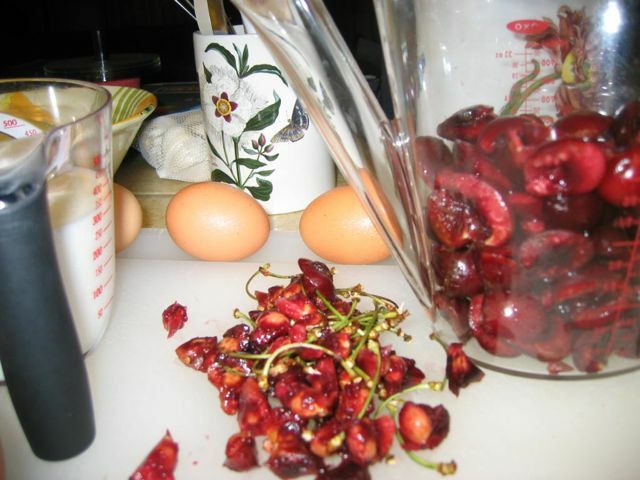 Spread the pitted, halved cherries over the batter in the plate, and sprinkle it all with the sugar. Then pour the remaining batter evenly over the cherries. Place the pan into the oven, middle position, and bake for about an hour or until the claufuti is puffed and browned on top, and a toothpick or knife inserted into the center is removed clean. Serve while still warm with a sprinkling (use a shaker or strainer) of powdered sugar, or with a side of freshly made vanilla ice cream. I wish I had a better picture of the finished product for you. Obviously I was much more interested in eating it than taking a careful picture. The aroma of the claufuti is heavenly, and I think it is at its best with a scoop of our home made vanilla ice cream as shown here. True confessions: I omitted the step of baking a little film of batter on the bottom of the plate. Perhaps for that reason, the claufuti came out a little moist for my taste, although it is a custard (or "flan" as Julia Child calls it) so maybe it was just as it should have been. I shall punish myself by making this again, and soon. One need not purchase special plates just to make a claufuti. But one could be inspired by a pretty plate. Hmmm I feel a cherry pie coming on. Bon apetit! The claufuti looks yummy! It looks similar to a cobbler.